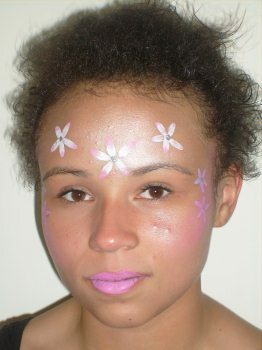 The coolestfairy face painting ideas are here for you to look at also get some free face painting ideas. I'm sure I don't have to tell you how much FUN kids have with these kind of toddler activities. 1. To start with cover the face with a sliver shimmer coat all over. Apply this very thinly so you get just a hint. Then add pink as a highlighter to the cheeks. 2. Next add three flowers across the forehead using white and pink for the petals. Use the white paint to form the petals. Then using a fine brush use the pink to add highlights to the petals. 3. 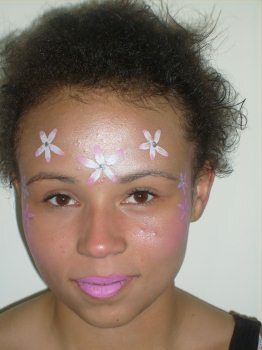 Next add some smaller pink flowers to each cheek using pink as the base color. Then using a fine brush add white to highlight the petals. Then add a silver center spot to all the flowers to finish. 4. Finally finish off by painting the lips in bright pink. This is a nice simple one to get you started. 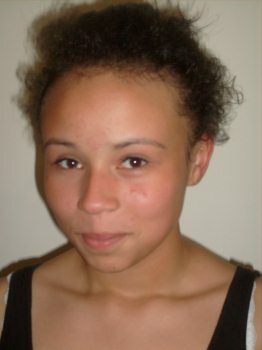 so why not have a go and get some practice with this easy face painting example. 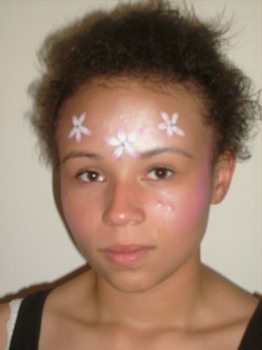 You can print of a fairy face painting template here as a pdf. It saves having to print the whole of this webpage. If your looking for more face painting ideas then this video below shows you how to face paint a fairy princess.